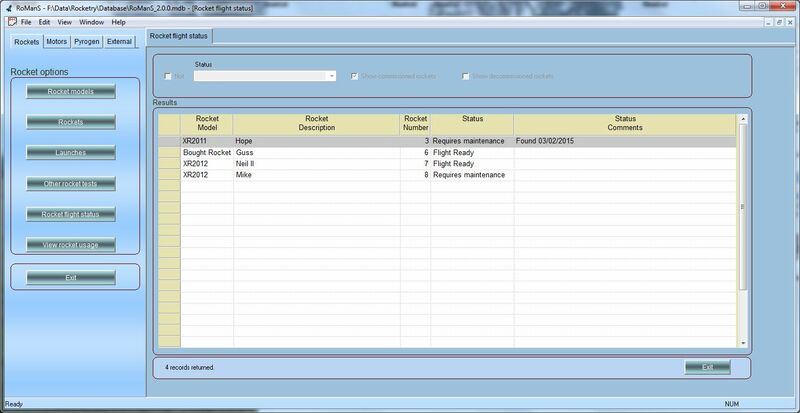 RoManS rocketry software is a complete Rocketry management system. 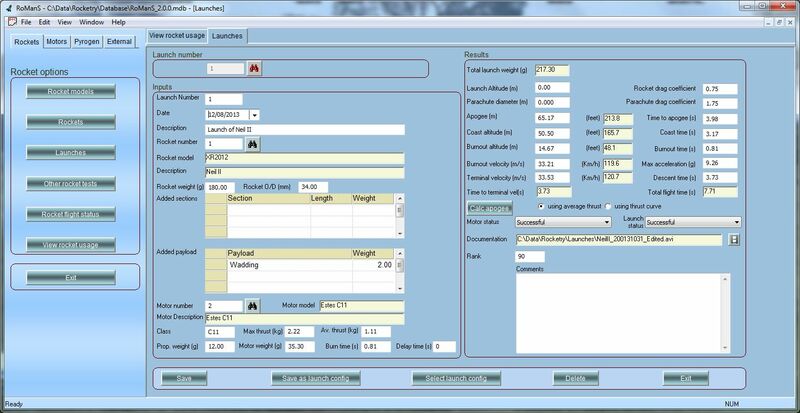 Whatever your level of interest in rocketry from developing new solid rocket motors and propellants to rocket flight simulation and keeping track of flights and motor performance you will find RoManS to be an extremely useful tool. RoManS comes with a comprehensive motor burn simulator allowing grains of different propellants and geometries to be included in a single motor. 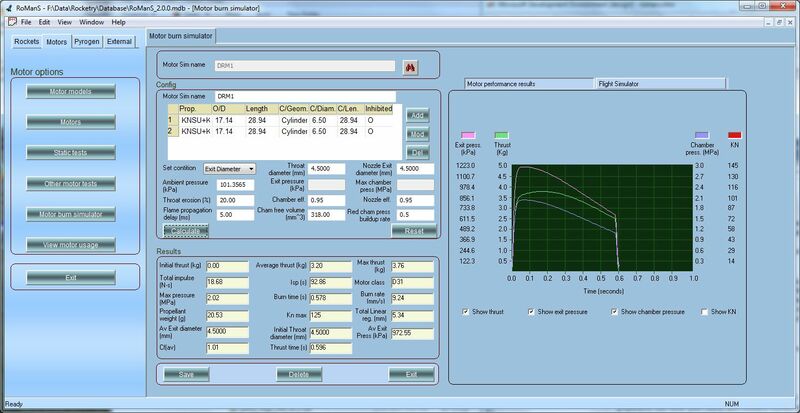 You can simulate the burn characteristics of an entire motor starting with the propellant followed by the delay grain and right up to, and including, the ejection charge. You can also use the simulated motor in RoManS rocket flight simulator. 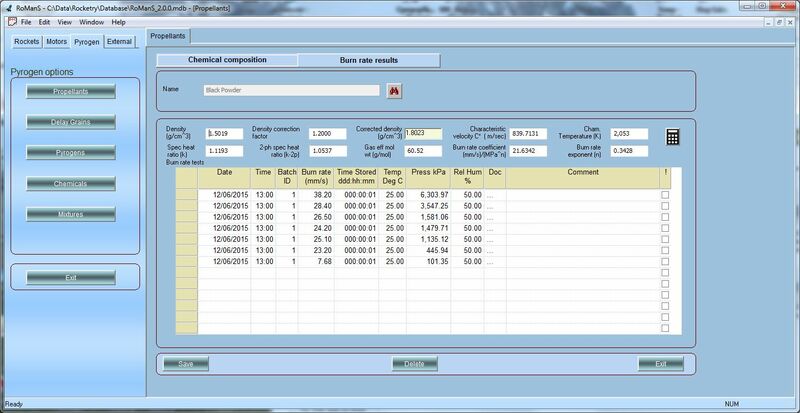 Thermo chemical analysis of propellants has never been easier. Simply enter the chemicals along with their proportions and press a button. 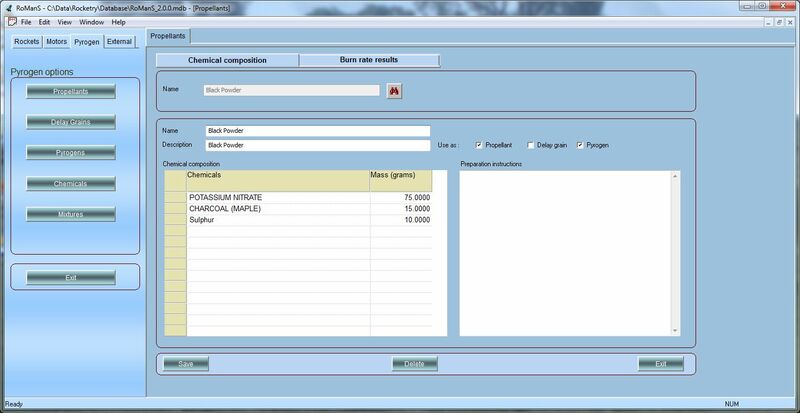 All the relevant information is displayed and can be stored in the database for future use. If you have the burn rates for different pressures you can use RoManS to calculate the burn rate coefficient and exponent. 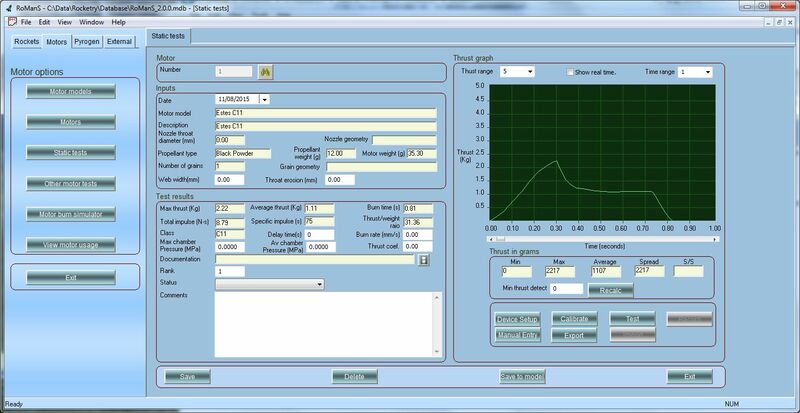 With the appropriate hardware connected to your PC you can also perform real life static test on motors to analyse their actual thrust characteristics. 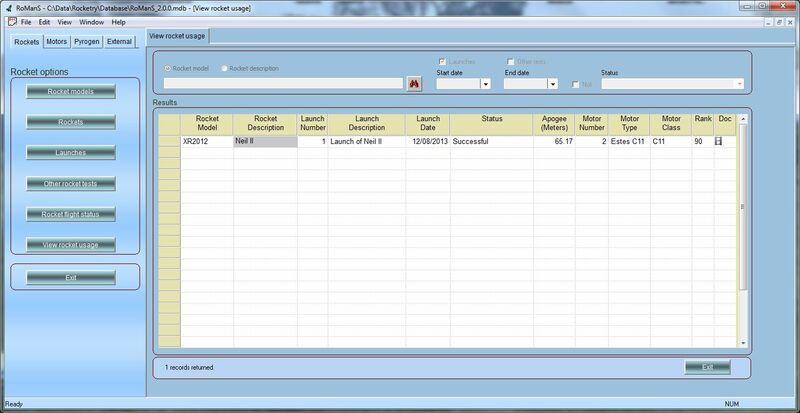 Use RoManS to organise and keep track of all your rocketry documentation including videos of launches and tests. It includes a document management system to keep track of any external documentation, such as files, web pages or even other programs. 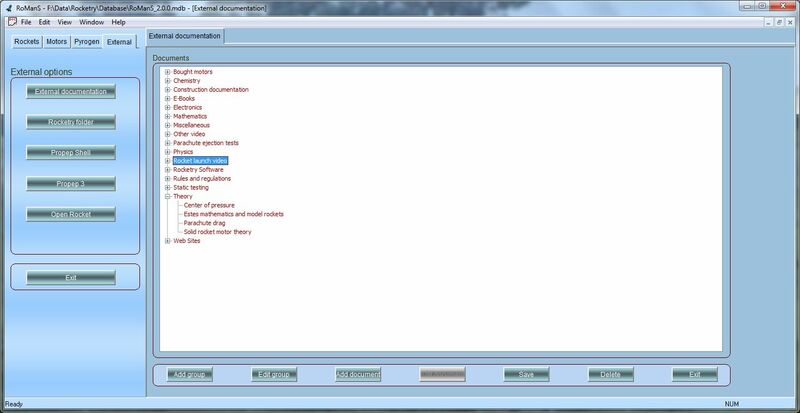 You can launch other programs you use from the user defined buttons or from the external document management system. 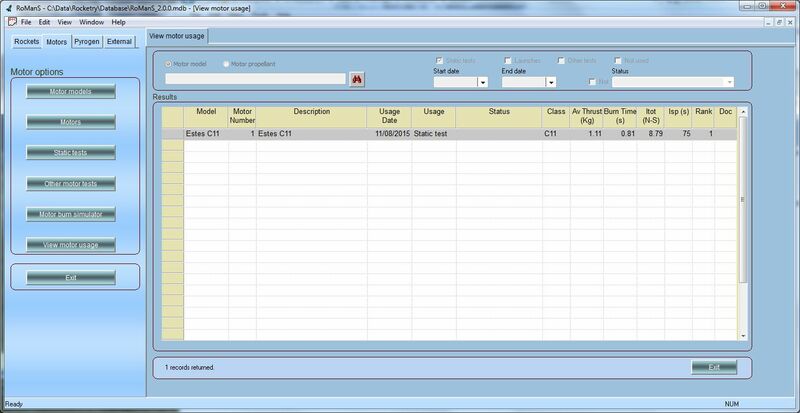 RoManS is installed by default with a database containing minimal information. 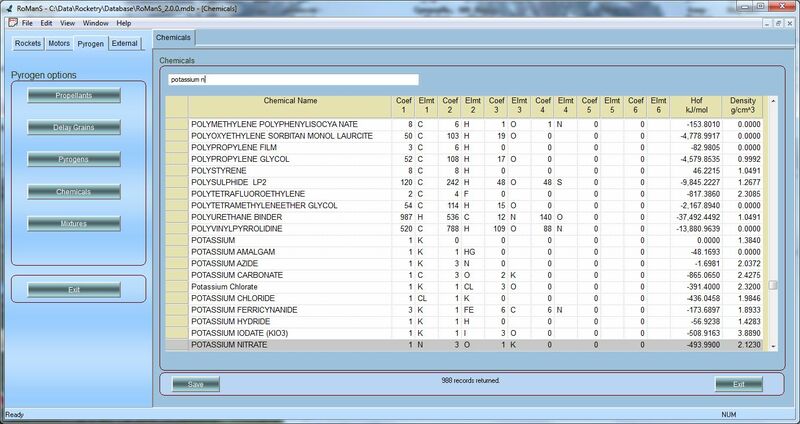 There is enough data stored for you to select various screens to get a feel for how it all hangs together. Download and install RoManS today. You can use it freely for 30 days so give it a try. Download it now and try it out for 30 days or purchase it for just $49.95 AUD.